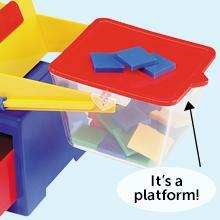 The clear buckets let children see for themselves what’s inside, which helps develop their estimation skills. The calibrated buckets hold up to 400 ml of liquid. Set young scientists up for success! Each bucket features an easy pour spout to make transferring liquids neater and easier. 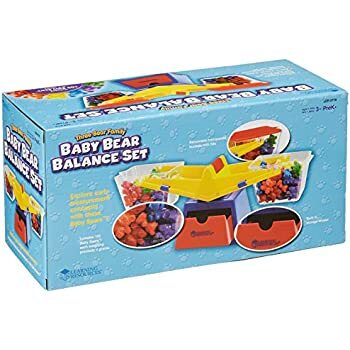 The removable buckets can hold liquids as well as solids like rice, sand, or counters. Adding the bucket lids creates a platform balance. 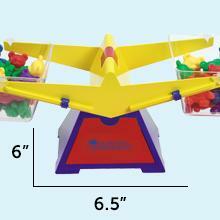 This sturdy plastic bucket balance measures 16.5” long by 6.5” wide x 6” high. 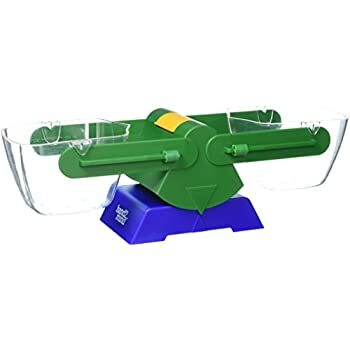 It’s a perfect addition to classrooms, science labs, and the home. At the center of the balance is a drawer ideal for storing weighs. Kids will also love tucking away treasures they want to measure and compare later. 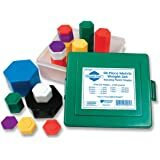 Learning Resources offers an extensive selection of language, math, science, and educational demonstration materials that bring subjects to life. From simple write & wipe tools to cutting edge technology, we have just what you need. 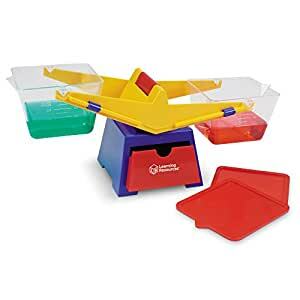 Learn mass measurement with this durable plastic balance. 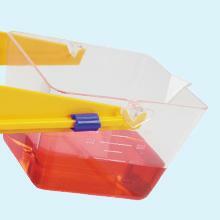 Removable, clear buckets with spouts are easy for small hands to pour. Features a built-in storage drawer perfect for storing weights. 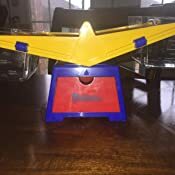 Another toy that my son had to have after playing with it at his cousin's house. I had thought about getting him a scale/balance toy but wasn't sure he'd play with it. This is the one I chose after reading all the reviews. He has really enjoyed it, too. The cups sit on the beam well and are easy to place and take off. The drawer is a little bonus as it can store little things to weigh/compare. And there are lids for the cups if you need them. I did not get anything to put in the cups (to balance) as I thought we'd have stuff around the house. And we do, but I wish now I'd gotten some counting bears or something specifically for this as sometimes his choices are less then ideal. It made of a light, hard plastic and probably would not stand up to a huge amount of abuse. But ours has been dropped on hard floors several times in the past year and is not damaged at all. So I would say it is durable if not abused. Edit to add: Two years later and this toy is still intact and has stood up to the wear-and-tear of a couple years play with an active child. We homeschool and my daughters are always measuring to compare things in length so I thought they might they might like a scale too. I was right....they love it! They put all sorts of different things in it to see what balances (1 princess Barbie is about equal to 3 princess clip figurines, lol). 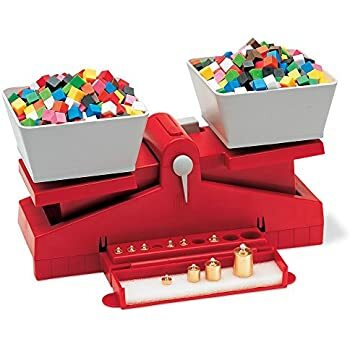 Easy to use, love the drawer to store weighted cubes or other accessories. The buckets come off and have pour spouts so measuring liquids is very easy too. The buckets also have lids which is great if you're using liquids or anything messy or even just transporting the scale from the table to the floor. 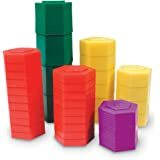 If you are measuring smaller items, you can use the lids as plates and place your items on top of those. 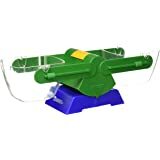 I have also taken this to our co-op and it has held up really well, no wear/tear even after (10) 3 year olds were using it! 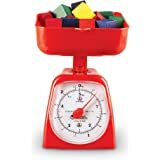 I bought this scale for my sons to replace an older (non Learning Resources brand) scale that had broken. Pulled it out of the box, set it up, and realized it was very badly unbalanced. After tinkering with the calibration sliders (these shift the weight on each side to -- hopefully -- correct for issues of slight weight variations to either side), it still couldn't be balanced -- one of the cups was far too heavy for even the calibration sliders to offset. After fussing with it a bit more, finding an absolutely perfectly level surface to set it upon, (this was a bit of a challenge as all of our surfaces were just ever so slightly not quite level), weighting one side with more than just the weight of the sliders, we managed to finally balance the gram of difference between the two cups. We marked the cups AND the beams to be sure to not mix up which went where when assembled, and now it's usable. Thankfully I had the tools I needed to correct for the issues, but that's not ideal. 1.0 out of 5 starsNot satisfied! It doesn't balance equally. 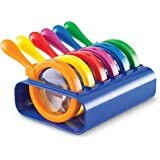 I got this for my toddler to teach him light versus heavy and when objects are the same weight. Waste of money considering it doesn't balance correctly. I checked it and put it on different surfaces and nothing made a difference, the scale is just messed up. I bought it for him months ago and never opened it because i was saving it for when we started teaching science so it's too late to return it, otherwise I would. I'm not sure if they are all this way or if I just received a defective item, but watch out. I am a high school math teacher. I thought this would be a good something to model algebraic equations for my algebra students. It did the job, but it's really kind of small for this purpose. On the plus-side, it's small enough that I can carry it around really easily and set it up on a student's desk if I'm working with just one student. It's also fairly precise--enough to distinguish differences within 1-1.5 grams. 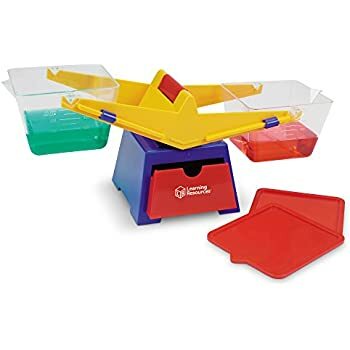 The booklet that comes with it recommends using the lids for the buckets as "plates" on top of which you can balance things, but the space is really, really limited as you can only place weights along the fulcrum of each bucket, which gives you about a 1 in x 3 in rectangle to play around with. Still, it does the job. I feel like for the price we paid, this was totally worth it. We did have to use the little plastic pieces on it to "calibrate" it - We actually had to move both of ours all the way to the right and at this point it barely makes it even, it seems like it wants to pull to the left, but... I wasn't expecting it to be perfect. 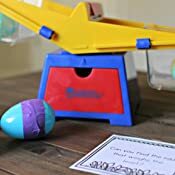 This is a plastic balance for young children, if you are expecting it to be something of higher quality I think you are expecting too much. My son needed one for an experiment we are doing for a third grade science project and this will do. Overall, happy with the purchase. I like that the scale tubs can easily be removed just by lifting up and can just as easily be put on (even young 2yo's can do it). 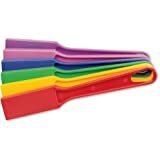 This makes for easy cleaning (I put them on the top rack of the dishwasher when needed) so the kids can put liquid or solids in them. Sand and beans are a favorite. The scale has a little drawer but mine has never been used, the kids just don't really have an interest in it. One thing that I don't like is the lids for the scale tubs. They don't lock on, they just sit on top of the tubs. 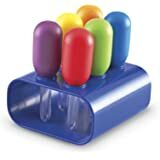 Any movement and the lid slides off, the kids don't like this either and at first would try and try again to put the lids on when they weighed stuff but then they'd lose interest pretty quickly and just set the lids aside. The lids don't ever get used at all now and for me it's just another useless "extra" piece. 5.0 out of 5 starsGreat resource! When I was a kid, weighted numbers and a scale helped me love numbers and understand arithmetic. I found this scale for my granddaughter. And, it was everything I hoped it would be. 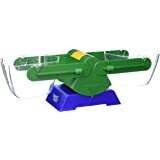 It is very sturdy, colorful and versatile. 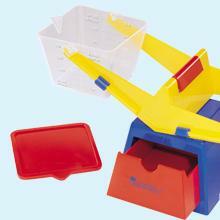 It comes with two removable lidded 'buckets' for comparing solids and/or liquids. 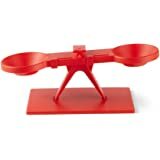 The scale is so sturdy, it should last my granddaughter for years and years, from being a toy to being a tool.